Tuatara is not only a living fossil that is around since about 200 million years. The lizards are of great interest for evolutionary studies because they have some incredible features such as a photoreceptive eye (the “third eye”), or their ability to hear, although no external ears are present. 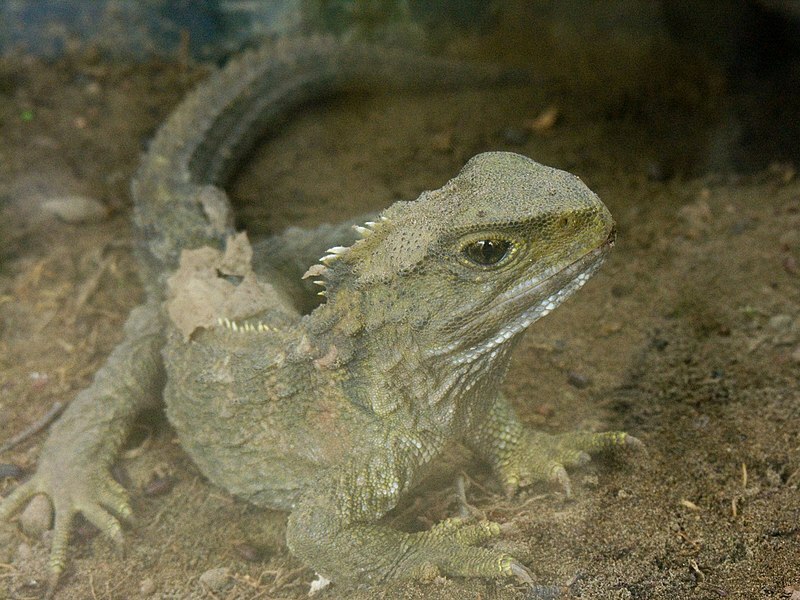 Most interesting for this list is their lifespan – Tuatara can become upto 200 years old. 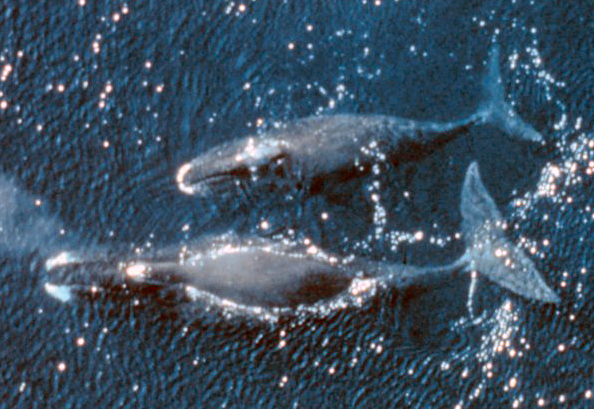 Reaching an age of 200 years is nothing if you are a Bowhead whale. The oldest ever discovered was said to be 211 years old. The whale can grow upto 20 meters in length and reach a weight of 75 to 100 tonnes. As it lives in Arctic and sub-Arctic waters it‘s also known as Arctic whale. Of course there are tortoises. We all know that they can become very old. They are actually considered to be the longest living vertebrates on Earth. But there are examples that scores off all the others. Harriet, a Galápagos tortoise died of heart failure at the age of 175 years in 2006. It was on the boat with Charles Darwin during his epic voyage. 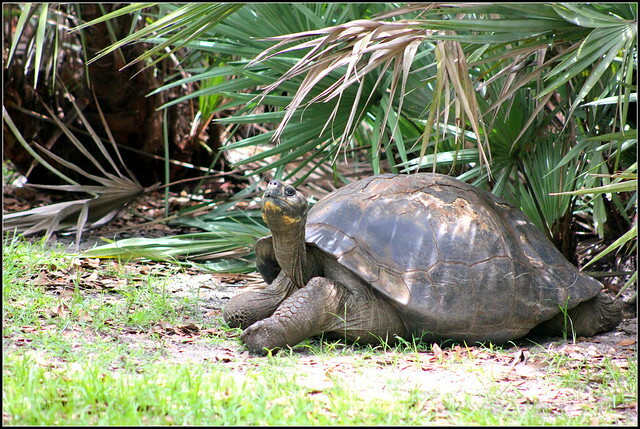 But maybe there‘s another record: An Aldabra giant tortoise named Adwaita is said to be died an age of 250, also in 2006. We stay in the water for a 4th example of extremly long-living creatures. Deep down in the ocean we will find Black corals. These tree-like corals with a almost black skeleton normally occur in the tropics. 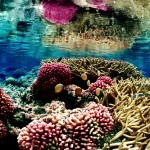 Now hold your heads: In 2009 scientists released research-results on those corals. And they said that they discovered specimens of the Black coral that reached an age of around 4,265 years. One reason is that these corals grow very very slow. That brings us to the king of long-lasting species. It‘s a bush ring in the Mojave Desert and it has it‘s kingness written in it‘s name: King Clone, a Creosote bush ring is estimated to be 11,700 years old. That‘s like wow. Who will beat that? The battle is going on for… some other millennia. 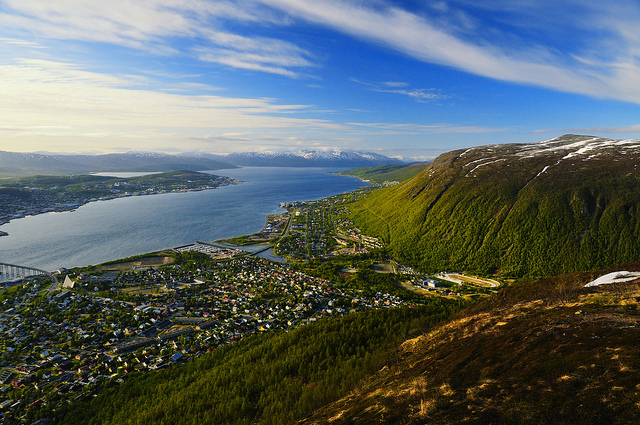 Arriving in Tromso, Norway, we are now located just at the Arctic’s doorstep. It is a quiet strange feeling, when you suddenly stand at the edge of something, that is normally so incredibly far away. If it’s far away from you as well and you derive from that that you don’t have to care – hang on. You actually should, as the Arctic often is referred to as earth’s air conditioner. And on hot summer days without (working) air conditioning, you feel perfectly well what it is good for. If you look at such pictures of the Arctic region it does not at all like an air conditioning. I was actually suprised that it can be that green in the Arctic region, as I always associate of snow and ice with Artic. What about you? But this ice is only there in winter time – that’s when it fulfils it’s cooling job, by reflecting 80 percent of sunlight back to space which then cannot heat up the ocean or earth anymore. But from March on, ice starts melting due to increasing temperatures. The decreasing sea ice cover uncovers the dark oceans that absorbs the sunlight instead of reflecting it – the cooling air conditioning turns into a heating facility. So far, the Arctic yet hasn’t been completely ice-free during the warm summer period. But you might remember scientists worrying last summerabout the small area that is left ice covered: The larger the ice free part, the more heat is absorbed by the ocean underneath – in turn, even more ice melts and a vicious circle starts. Not on the edge of the Arctic, but on the edge of Arctic research, you find scientists working on how this influences the Arctic environment. Sometimes this influence can even be positive: Researchers recently found that microbes in the soil can fix more carbon in a warmer climate. But yet, researchers cannot tell how Arctic ice cover will evolve, but they work for example on better models to predict what is going to happen. That is especially important, as many earth systems are connected: A warming Arctic sea also affects ocean currents for example, that – connected to each other – span over the whole planet. In turn, oceans take up less CO2 for example, and in consequence more of this greenhouse gas in the air, warms up the whole planet. Freezing temperatures, darkness, vast icy landscapes – that’s what I’m expecting within the next days as I journey northwards through Sweden and Norway. Maybe those are just stereotypes I have as I travel towards the Artic circle (and actually even cross it into the Artic region). I’ll soon find out. But I’d like to take you along on my exciting journey. Credit: Map courtesy The Perry-Castañeda Library Map Collection. Treeline added at NSIDC based on information from National Geographic 1983, Armstrong et al. 1978, and Young 1989. What is so special about the Arctic circle? The circle of 66,65° latitude (commonly) defined as the Arctic circle, above which the sun doesn’t rise or set for at least 24 hours a year. In fact, in most regions these states last for several month of the year. Additionally, temperatures can fall below -70 degree Celsius and usually do not rise higher than 10 degrees in summer. That may not sound very comforting. But, actually there are several animals, plant species (there are more than 400 flowers that can only be found North of the Arctic circle) and people who live and flourish here – traditionally as well as for research purposes. Because living beings have to be well-adapted to such tough conditions in order to survive, the regions and its inhabitants are especially sensitive to changes due to global warming. Scientific measurements showed that temperatures in the polar regions are two to three times quicker than in other regions. That is why it is said to be the planet’s early warning system. What’s next on this journey? I’d like to show you how a relatively rich country like Sweden harnesses green energy sources – and why some people protest against it. In addition, I hope to introduce to you some non-human climate rescuers. At the end of the year you get flooded with reviews of 2012. We won’t bore you with another one. Well, we can’t do without revisiting last year at all. So here are some interesting bits and pieces of info on what happened in 2012 from a climate change perspective. Oil and coal are set to be phased out sooner or later, scientists are busy exploring alternatives. One of them comes straight from the gut. No kidding. In January they presented genetically engineered gut bacteria that could convert seaweed into ethanol. If the process is feasible on large scales, this may help solve the fuel-versus-food- dilemma. Flood protection for coastal areas, habitat to thousands of species: coral reefs maintain several critical roles in the Earth’s ecosystems – some of which are under particular threat due to climate change. But at the same time corals themselves are threatened by global warming, as NASA scientists confirmed in February following one of the most comprehensive studies yet undertaken on the issue. Rising water temperatures and increasing acidification lead corals to dissolve and die – and the loss of their protective role. But there is also good news: There is a shift in the climate change debate – from “does climate change exists?” we’ve moved on to “what impacts does climate change have?” and in the best case “how can we prevent it?”. March saw the public discuss a question – well in line with this new level of awareness: Has climate change been underestimated so far? Scientists warned, the global mean temperature could rise by 3 degrees Celsius by 2050. Climate change is not an isolated problem, but associated with other issues – like food security for example. So, in April, experts and locals discussed at the Climate Smart Agriculture in Asia workshop how to secure rice production in a warming world with more intense droughts and rainfalls. 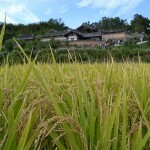 Rice is the staple diet for more than half of the world’s population. At present some 870 million people are already suffering from hunger – not to imagine how this situation will worsen if rice production falls short. In May world leaders met in Bonn for climate conference – but were not able to agree on any effective measures. At least a little more optimism could be found at the Rio+20 conference in June: Our reporters Kerstin and Philipp were there for you, presenting innovative people, their ideas and opinions. Re-experience their trip here. To mitigate global warming, researchers also come up with controversial ideas – most of them attempts to fix the climate by resorting to geoengineering. One idea was highly disputed in July: by dumping iron into the ocean, the ocean’s ability to act as a carbon sink should be increased. Even some climate skeptics were finally convinced of the reality of climate change, when severe droughts and heat waves hit the United States in the summer months around August. 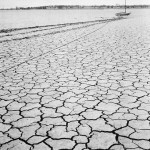 Russia also suffered from extreme droughts, but for the US 2012 has been the hottest year ever recorded. From dry and hot regions to cold ones: in the middle of September the Arctic ice cover reached an all-time low. Ice melting during the summer is not unusual, but the rate of melting and the large area affected astonished researchers. Watching the densely populated US East coast brace for the impact of super hurricane Sandy in October, many people around the world paused – the effect of climate change appeared so undeniable as hardly ever before: More and more people in the United States – the developed country with the highest CO2 emissions per capita – start believing that climate change is real. Following the strong winds, in November researchers declared that sealevels are rising quicker than expected: in fact, the oceans are rising 60 percent faster than previously thought. In December super-thyphoon Bopha hit the Phillipines, being far stronger than the storm that killed more than 1,200 people in the same region a year earlier. Furthermore the next IPCC report – to be published in 2013 or 2014 – was leaked, revealing that CO2 emissions caused by humans are now “virtually certain” to be the reason for global warming. As this is not really new to a lot of people, country leaders discussed at the climate conference in Doha, Qatar how to deal with climate change. Our reporters Kerstin and Klaus went to Doha for you – revealing all the green ideas they encountered there. 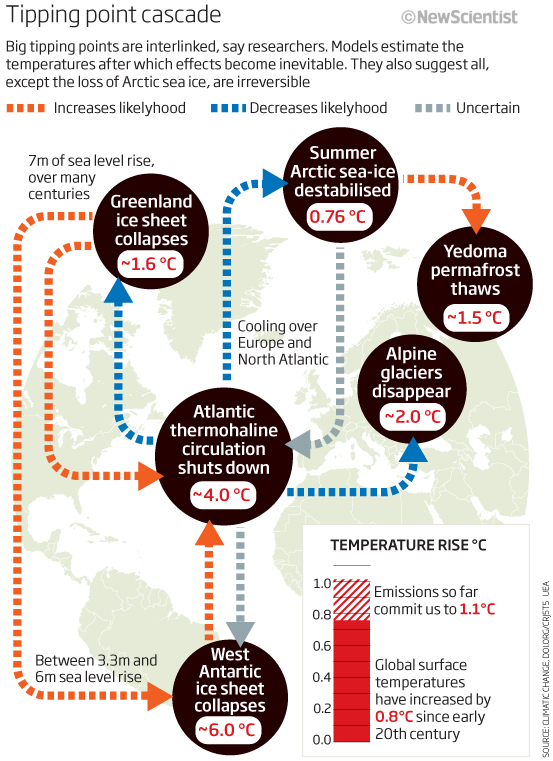 What would you say – anything else we should include to complete our 2012’s climate-change-review? Is the ice-free north-pole just a matter of short-time? Within this year’s summer period the arctic sea ice shield at the north pole melted dramatically to a new all-time low. The ice mass has fallen short of the record of 2007. And the low could get even lower, because the 2007 record was measured at 18 September. This year we saw the same record already in August. 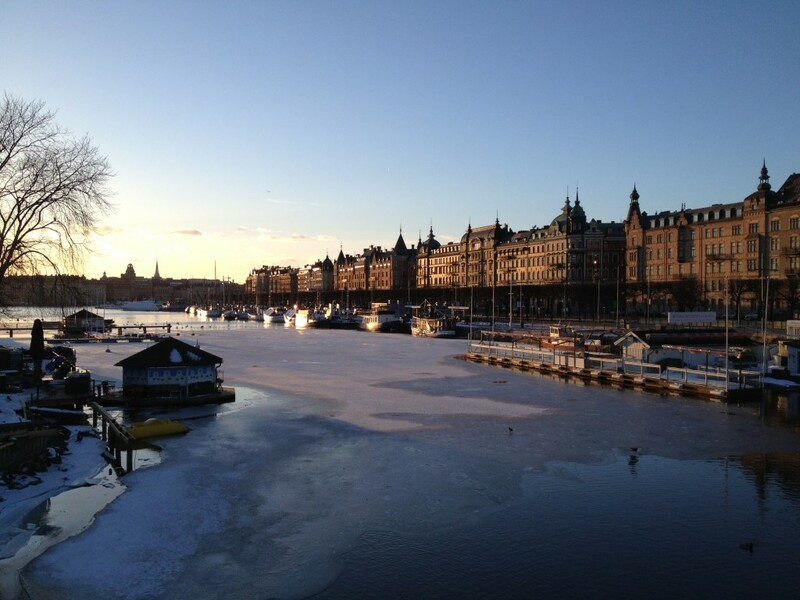 The ice usually melts until the mid of September and then starts again to grow during the winter period. But due to the large melting the new ice will be much thinner than usual. Scientists of the National Snow and Data Center explain that where have been an ice shield of a 3-4 meters just a few years ago, it’s possible to reach only 1-2 meters today. An ice free noth-pole could be the result, they say, followed by the irreversibility of the melting process. According to the Arctic Sea Ice Blog it’s just a question of when until we will see an ice free north pole.If you want to stay updated on that issue, there are lot’s of impressive and in somehow frightening opportunities. The picture on top of this post is provided by the Instituts for Arctic Climate Research at the University of Illinois. It’s going to be updated every day. So it will be possible to see the day the ice will be growing again. The website also offers a 30-day summary of the ice developement. You will also find tons of data about the planet’s ice shield’s via the National Snow and Ice Data Center.